The world is a rare & unfathomable place. Here is how it looks through the slant of my lens. I write about life and thoughts and goo. There are links to book reviews I’ve written. Some creative pieces I’ve had published, and links to real-world publications, too. The occasional film review. I write a lot about the Knicks. Once I did a mixed media poem thing. That was cool. 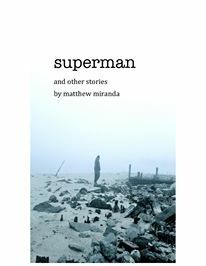 My debut short story collection, Superman, will be available the moment it is. My publications include short stories and memoirs (Carrier Pigeon; The Southampton Review), flash fictions (Black Heart Magazine), micro fictions (Postcardshorts.com), book reviews (Prick Of The Spindle; East Bay Express; Artvoice), and sports articles (Posting&Toasting.com, The Times Beacon Record; Sports & Leisure Magazine). I provided editorial services for David Berg’s memoir Run, Brother, Run (now available from Scribner) and have edited novels, memoirs, and short story collections. I’ve taught grammar, academic writing, literature, playwriting, novel-writing and flash/micro fiction. I’ve also worked as a grant editor and consultant. Cady McClain, who I told my 9th grade Spanish class I was going to marry, once favorited and retweeted my lemon & mint water recipe (ingredients: lemon, mint, water). The two coolest people I’ve met were Ralph Nader & Chuck D. Chuck praised my threads. Can’t beat that.